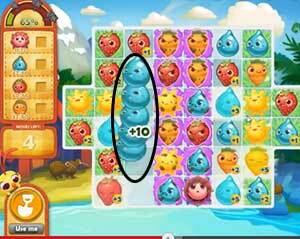 These Farm Heroes level 187 cheats and tips will help you beat level 187 of Farm Heroes. 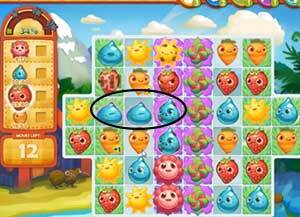 The objective of Farm Heroes level 187 is to collect 12 flowers, 60 droplets, 60 strawberries, and 60 carrots in 18 moves. Flower cropsies take three adjacent matches before they bloom. Once they are in the bloomed state you can collect them to meet your level objective. Be careful, these flowers are on top of grumpification tiles! There is a high threshold of cropsies to collect to meet this level objective. 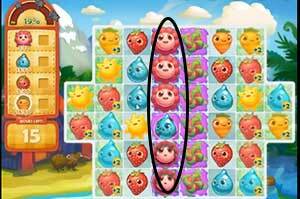 Make sure to combine as many 4-6 chain combos as you can to rack up the point modifier on nearby crops. This will make it easier to reach your goals! The grumpification squares under the flowers on Farm Heroes Saga Level 187 will nullify any points you make from matches. Don’t line up cropsies next to ones on top of the grumpification squares to avoid this terrible fate!